Have you ever had any burning questions about autism that you’d like answered? Is there any aspect of autism that you’d like to know more about? Continuing on from my post discussing if you should tell your child that they have autism, this week I’m going to discuss how to talk to your child about their diagnosis. When should I tell my child they are autistic? As with autism, the answer to this question is entirely individual. Some higher functioning autists may be ready for this information at a younger age than others, or may even be so high functioning as to not need this information during their formative years (as in my case- though in hindsight it would have helped a lot!). Timing can also vary with the age of diagnosis. Girls for example are often diagnosed much later in life than boys with autism. In general, many experts recommend telling your child around the time they start to become self aware of their differences to their peers- roughly around 6 years old, but this awareness will vary among autists. I, for example, always felt that I was different to my peers, but I never openly questioned it until after I had received my diagnosis in my 20’s. How do I tell my child they are autistic? How do I explain autism to my child’s siblings? Hope you found this post useful Earthlings! Should I tell my Employer I Have Autism? In continuation from my previous post, I’d like to discuss a very important question for autists in the workplace: should you tell your employer that you are on the spectrum? This is a tricky one to tackle. On the one hand, your employer can better support you and help to adjust aspects of your role to suit your needs; on the other, many employers are poorly informed about autism. As a result of this, you may be misjudged and your true potential overshadowed by the big bad ‘A’ word. In my career, I have had both positive and negative experiences when informing my employer. One employer was highly supportive- my diagnosis was openly discussed and viewed as an asset. In another position, my abilities were overshadowed by my diagnosis. Having Asperger’s was seen as a problem, and my career was reluctantly diverted down an entirely new road (which thankfully was fruitful). As a result of this, I chose not to reveal my diagnosis to my current employer in order to allow my work to speak for itself without an autism filter. There is no right or wrong answer to this question; the answer is entirely individual. In my case, thankfully my needs are minimal (a bottle of water and some snacks go a long way towards managing my more eccentric behaviours, and the occasional cake will help distract from foot-in-mouth tendencies 😛 😉 ). I am in the lucky position where I can pass for neurotypical, however, there are many autists out there that may struggle in the workplace if not adequately supported by their employer. Ultimately the “right” answer is what is right for you. Assess the situation- Do you need the extra support? Would you feel more comfortable/uncomfortable if your co-workers were aware? Is this the kind of company that will support you if you choose to tell them? At the end of the day, it’s up to you. You are under no obligation to reveal this information if you are no comfortable doing so. And remember- whatever your decision, it will all come right in the end. If an employer doesn’t want you, then you don’t want them. Should I Tell My Child They Have Autism? So today we’re going to discuss a very important question when it comes to growing up with autism- should autists be made aware of their diagnosis? Now this question is a little bit tricky. On one hand, we have the parents who do not want their child to know at all; they want their child to grow up as “normally” as possible so that they may never be held back by the autistic label. In a sense, part of me would agree with this approach. In a lot of ways, growing up undiagnosed was a blessing in disguise. I was never treated differently (well, by teachers at least- children are another kettle of fish!) and I grew up to be a “normally” functioning adult with a job and friends, never held back by the autistic label. Whilst I can appreciate a parents desire for their child to thrive, the decision not to tell a child about their diagnosis ultimately amounts to sticking your head in the sand. We cannot ignore autism and pretend that it’s not happening. There needs to be interventions, strategies and most importantly, understanding. 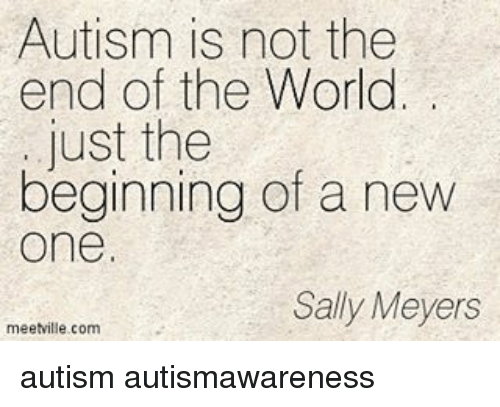 We don’t just grow out of autism, we need to cultivate an environment so that we can grow around autism. Without self awareness, this will ultimately make life difficult for your child. What if they found out some other way that they were autistic? If they overheard a teacher, accidentally caught sight of their notes or were taunted by another child? How would you feel if your parents kept something like this from you? At the end of the day, your child needs to know about their diagnosis; maybe not today or tomorrow, but when the time is right, they will need to know. Yes, there were some advantages to getting a later diagnosis, but ultimately, life would have been so much simpler for both my parents and I had we known that I was on the spectrum. We would have known how to manage meltdowns, my peers would have understood me better, I wouldn’t have tortured myself for being different- I would have understood and learned to better accept and love me all the sooner.